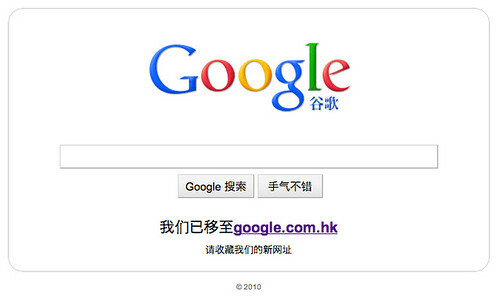 In March, Google began redirecting Google.CN to Google.com.hk in order not to censor the Chinese search results anymore. Well, China isn't happy with that, they simply do not want their Chinese users to get unfiltered results. Google has been threatened by China that if they don't stop redirecting users, they will take away Google's license to operate in China. Google caved - they want to still operate in China, although they said they don't want to operate there - it is confusing, you see. So now, some people who go to Google.CN are being send to a special landing page at http://www.google.cn/landing/cnexp/indexd.html. This landing page will soon become the default at Google.CN. The landing page is one huge link that when clicked, takes you to Google Hong Kong. Technically, it is not a redirect, but to a user, it does seem deceptive on how the implementation was done. It appears that you are clicking in a search box to do your query. But when you click, you are redirected to Google Hong Kong. That seems deceptive to me. Google should man up and leave China and stop playing games. If they want to stay in China, then deal with it, filter the results and stay. But to do it this way, just seems wrong to me. What do you think? Yes, it says Google.com.hk but it just seems way confusing for the user. And isn't Google all about making it best and not confusing for the user? Forum discussion at Google Blogoscoped Forums and WebmasterWorld.